Kaia and I recently began reading The Omnivore’s Dilemma – Young Reader’s Edition. She wasn’t super interested when I mentioned it, but she was hooked after the first chapter. The first 100 pages discusses the industrial food system from farm to store, focusing on corn. Kaia was amazed by how common corn is in our lives, not just in food, but in medicines, packaging, glues, paints, cosmetics, antibiotics, and so much more. We decided to take a trip to the local grocery store with a list of corn products, just to see what we could find. We walked down the aisles picking things at random. Out of 30 products, there were only 5 that did not contain corn: two varieties of crackers, Enjoy LIfe Chocolate Chips, some gluten-free wafers, and a B-12 supplement. In the other 25 products we found corn and its by-products 106 times!!!!! We found it in things like pineapple juice, mayonnaise, Cheerios and other cereals, non-dairy creamer, pet treats as well as cat food (cats are obligate carnivores and should definitely NOT be eating corn! ), fish sticks, wet walnut toppings, candy, crackers, frozen burgers, BBQ sauces, peanut butter, TV dinners, ice cream, baby tooth paste, icing, chili seasonings, gluten free ice cream cones and bread mixes, Centrum vitamins, and in jelly (4 different corn by-products in this jelly)! All of this and we only made it half way through the store when we decided to stop. WOW! Just WOW! So, how many of these things really need corn in them? Have you ever made home-made ice cream with corn? What about jelly? Doubtful! Corn is shoved into just about every processed food! And that’s not even counting the corn that is used to feed the cattle, pigs, and chickens that produce the meat and eggs in the store, or the ethanol that’s used transporting some of these products, or the corn starch used to make some of the packaging, or the corn used to make the glues to seal the packages! 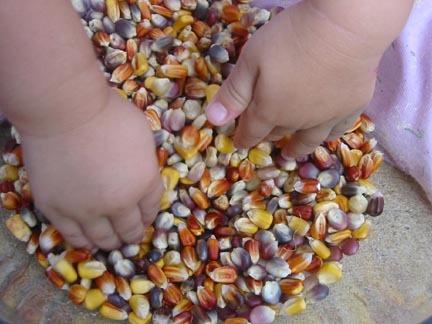 From the list we brought to the store, we found corn in the form of: ascorbic acid, coloring, cellulose, citric acid, corn, corn meal, corn oil, corn starch, corn syrup, high fructose corn syrup, dextrose, flavorings, hydrolyzed vegetable protein, malt flavoring, maltodextrin, polydextrose, polysorbates, sodium citrate, sucralose, tocopherols, and xantham gum. If you’d like to take a look in your local store, or how about in your pantry, here is the list we used to get us started. This entry was posted in Mothering, Sustainable Living.